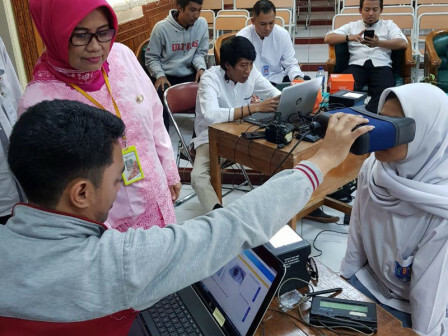 South Jakarta Population and Civil Registration (Dukcapil) Sub-department will visit 34 senior and vocational high schools (SMA/SMK) to conduct e-ID data recording for students who will turn 17 years old until March 2019.
" Dukcapil Sub-dept. will distribute students' e-ID cards to schools that have been visited in this service"
South Jakarta Dukcapil Sub-department Head, Abdul Haris stated, his side previously has visited SMKN 20, Cilandak to conduct e-ID data recording on December 2018. "Our target is students who will turn 17 years old. This door-to-door service will be started from January 10," he conveyed, Tuesday (1/8). South Jakarta Dukcapil Sub-department's Civil Registration Service Section Head, Endang Susilowati stated, her team will conduct e-ID data recording at SMK Negeri 28 on Jalan Maritim No 26, Cilandak. "Dukcapil Sub-department will distribute students' e-ID cards to schools that have been visited in this service thus students don't have to go to urban village to take it. e-ID card distribution will be done D-3 before 2019 Presidential Election," he explained.